I’ve seen a few versions of ribbon paperclip bookmarks on Pinterest, and I thought they would make the perfect classroom gifts for my girls to give their friends in our homeschool group. 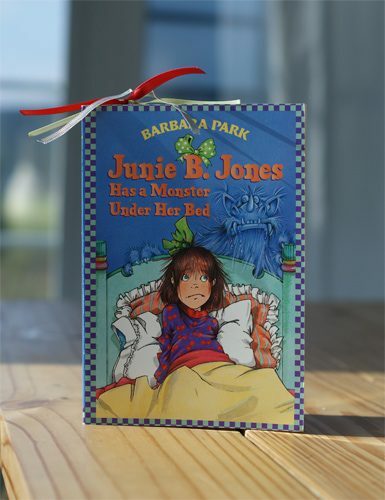 The only problem is that a bookmark with a few ribbons tied on the end — while absolutely adorable when used in a book — is not exactly an easy gift to hand out (or keep track of! ), so I created these “Happy ‘Owl’-idays” postcards to hold the bookmarks. I think they turned out so cute, and my oldest had so much fun making these for her friends. 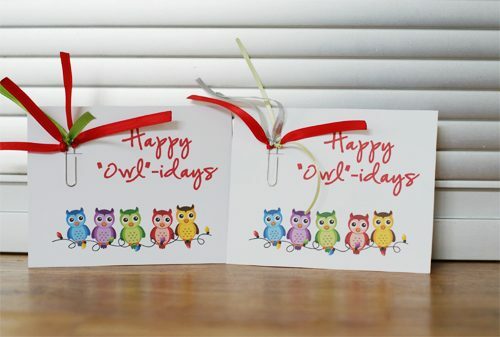 Print out the “Happy ‘Owl-idays'” postcards on cardstock (they print 4 to a page). Cut them out and use an exacto knife or razor blade to cut the slit for the paperclips. Cut your ribbon in 5-6″ pieces. Tie 3-4 pieces onto the end of each paperclip. Insert a paperclip into the slit of each postcard. That’s it — easy, fun and cute! Join us as we celebrate 101 Days of Christmas with new DIY projects, gift ideas, traditions and more every day from now through Christmas!